Soria was a sunny and contented little place. A regional capital that didn’t act like one. It has the population of a small town and the countenance to go with it. As was so often the case in Spain, as soon as you left the big few cities - Madrid, Barcelona, Malaga, Valencia, Bilbao, Sevilla - everything sort of fell away and collapsed gracefully into a world of provinciality. A few silent streets, narrow and cobbled and shuttered up, led to the main square. A small arcaded town hall hewn of honey-coloured stone sat next to a similarly porticoed slab. In the centre fat country pigeons whipped around a fine fountain. The opposite side of the square evoked that of Seville’s Plaza de San Francisco; though far more shrunken and scruffy. Little glass galerias and Juliet balconies jutted out over cafes, their chairs, tables and umbrellas. The peculiarity of Soria was its almost gluttonous abundance of medieval and romanesque structures. 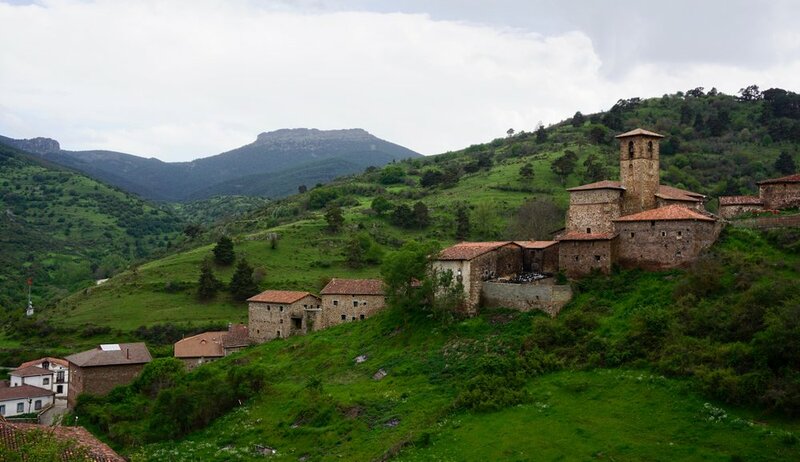 It was as if the the rest of Spain couldn’t find the space in its busy roster for San Juan de Rabanera, vine-covered San Polo monastery, the staggering Santo Domingo convent church, the haunting ruins of San Juan de Duero or the Soledad Hermitage. The most staggering of all though was the San Saturio Hermitage. This ochre-coloured church was stuck on the side of a granite wall and seemed to hover over the Duero. The only access was up a steep and narrow rock staircase through the hot May air, all full of the fluffy spores of Spring. Between Soria and La Rioja is a large mountain system comprising various ranges: Demanda, Cebollera, San Lorenzo, Picos de Urbión. Luckily for the driver there is a fast road that shoots though the gentlest part of a valley direct to Logroño. But then there’s no fun in that. Instead the slow road was taken in an effort to pick up some of the remotest mountain villages in the region. 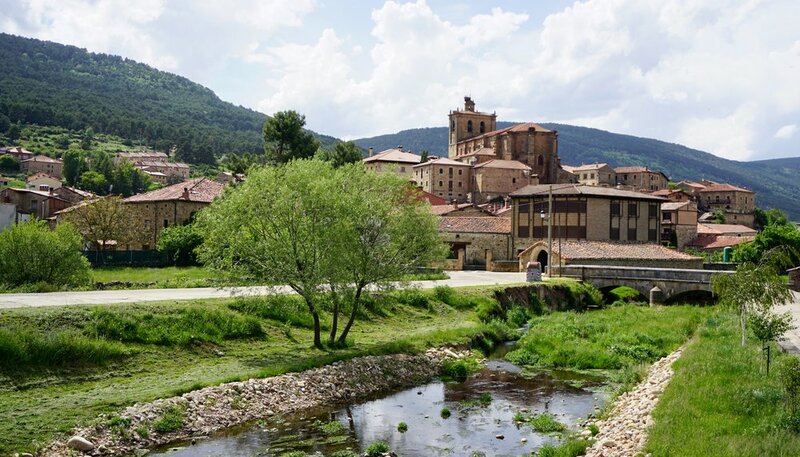 Vinuesa was a smart and proud little place that lay, like the dogs who sunbathed in its alleys, lazily along the small Revinuesa river. It was clean and full of cobblestones. The buildings were smart and in good shape, the roofs and attractive jumbles of tiles and the walls big and stony. It felt fairly visited and prosperous. Sounds emanated from the cafes that had recently woken up and the sound of tractors buzzed in the background. A friendly shambles of a dog befriended me as I hiked up the streets. A bizarre guardian/ambassador to put me at ease; the village had a rough and oppressive air. There were no people; just the shouts of owners screaming at farm dogs that bayed at me with snarls from the shadows. The surreal juxtaposition of this forlorn place was the mouth-watering views out around to the muscly and green mountains. Also, though my memory might have cheated me, it was one of the first villages I ever remember seeing not having even one bar. This was a sad and forgotten place with a cruel beauty. We pushed on further to our deepest point, to another village with yet another different atmosphere: Vinegra de Arriba. The mountains rose high and then fell away to a tight road sunken into the space between the folds. This village was very pretty and had the air of an old people’s home made entirely of rounded, fist-sized cobbles. Everything was attractively stony. The buildings were big and blocky with orange roofs, and the streets caved inwards so the rains could run off. Old men sat out on benches by the road glueing their eyes with odd curiosity on any car that trundled by. Other than that, there was no sign of life; just a few plastic tables and chairs out in the main square, though where the bar was we had no idea. Driving in these parts was impressively slow and winding and taxed the concentration. The light was fading and the clouds were coming in. We passed odd little Anguiano - a cluster of homes and an ancient bridge at the base of a punched-up thumb of volcanic anger - and arrived at Logroño, happy to remind us what Spanish nightlife was like.